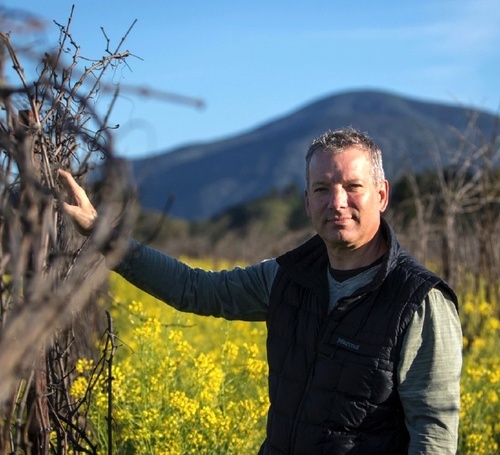 Ken Bernards is widely acknowledged as one of California's visionary winemakers. Since his first harvest in 1986, Ken has remained on the leading edge of winemaking techniques in California, using scientific experimentation in the vineyards and in the winery, while at the same time adhering to traditional, small-scale methods, such as small-batch fermenting. Thus his winemaking philosophy: creating wine is a delicate balancing act between traditional wisdom, scientific analysis, and artistic insight. Ken obtained his degree in chemistry from Oregon State University in Corvalis. Upon completion of the program, he accepted a position at Domain Chandon as a research enologist. There he was able to design and conduct experiments in both viticulture and enology. Winemaking, however, is both art and science, and a visit to Burgundy, France awakened the artist within the scientist. In 1992, Ken began making wines for his own label, Ancien, and started developing the portfolio of Pinot Noir wines that he is famous for. Since then, he has continued making wines in Napa, Oregon, North Carolina, and Chile. Ken began making wine on the Porter Family Vineyards property while it was still under the previous ownership, and produced several vintages of highly acclaimed and highly rated Cabernet Sauvignon and Syrah. Over the past decade, he has come to understand the property and it's unique characteristics – the different volcanic soils and the variety of slopes and terraces, how the vines ripen at different rates in different areas, and how the different clones behave in this location. Not only has Ken contributed his skills in winemaking to Porter Family Vineyards, he also helped create the winemaker's dream that is the Porter Family Vineyards in-cave winery. Ken's years of experience allowed him to know exactly how the winery should be designed to maximize gravity-flow processes and facilitate the production of world-class wines. Ken's passion for great winemaking, along with his scientific curiosity and extensive knowledge, made him a perfect fit as winemaker for Porter Family Vineyards. We are excited that he is a member of the Porter Family team and that we will be a part of his continued quest to discover more and more about the science and art of making timeless and expressive wines.